In June of 2003, numerous people from around the world came together for the first gathering of the Humanity's Leadership Team in Portland, Oregon. 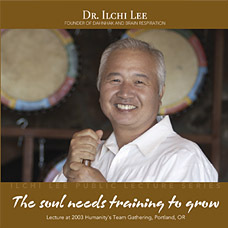 This audio CD contains Ilchi Lee's insightful lecture from that meeting. In a speech punctuated by music and humor, Mr. Lee shattered our fixed concepts of spirituality and talked about the true meaning of the growth of the soul. The energy of his voice and his message on this CD will help feed your soul and accelerate its growth. This live lecture CD is part of a public lecture series that includes the "Beyond the Name and Personality" and "Peace in the Brain" lectures.